The box you see pictured was created in painstaking detail for a client as a gift to his girlfriend, to immortalize her childhood home. 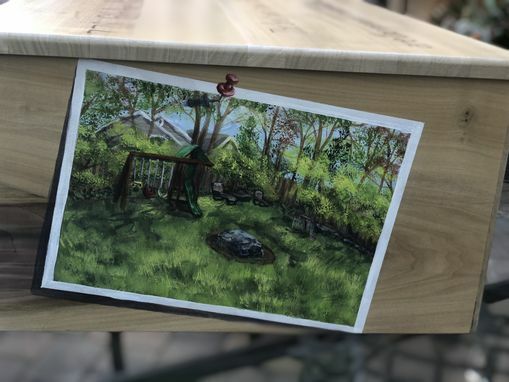 I sought out an expert woodworker to custom craft the box out of poplar wood to the client's specifications (he requested 20" x 15" x 8"), and then we got to work. He sent me images he had sneakily snapped without his lady love's knowledge, and I recreated them as "photographs" that have been haphazardly "pinned" all over the sides of the box. 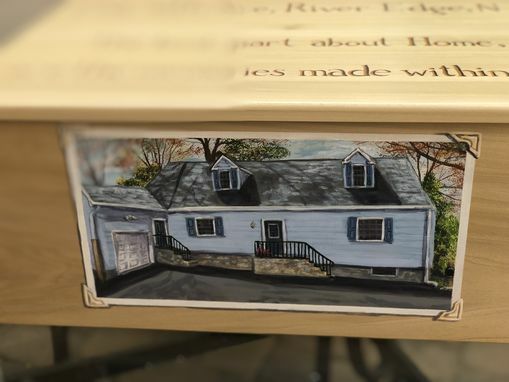 The front view of the beautiful Cape Cod home adorns the front of the box, the street view on one side, and an image of the lush green backyard on the other--with the central rock and the wee soccer net as important sentimental details! Once you make your way around the box, we enter the house on the back side with the warm, homey family room. 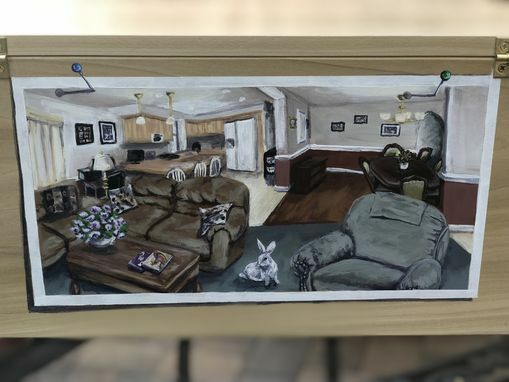 Here is where I was able to incorporate lots of personal details: the white rabbit was a special request, as were the photo collage on the wall, and the specific books on the coffee table. 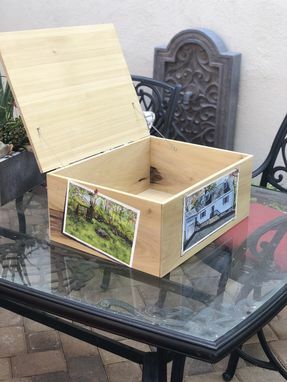 Each "photo" looks as if it was fastened to the box in a different way: glue-on corner tabs, thumbtacks, even a couple of round-headed sewing pins! 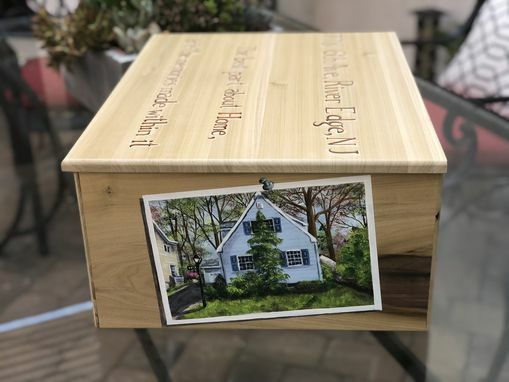 For the top of the box, the client requested the address (cropped out for privacy) and a special quote, which I hand lettered in a "carved" style, giving it a truly three dimensional look. 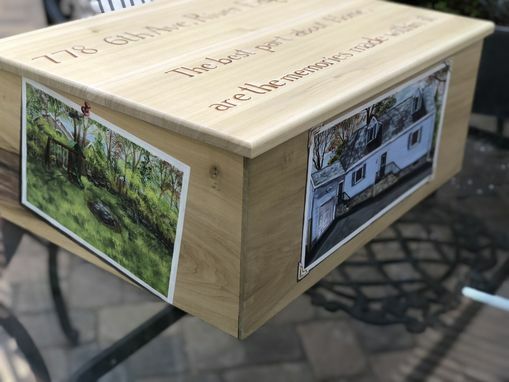 This box is infinitely customizable, from its size to the type of wood to the subject matter--whatever treasured images you want to capture! Price reflects a box of these dimensions, will scale if you choose a different size. Each one of a kind piece is signed and numbered for authenticity; please allow 10-12 weeks for creation of your masterpiece.